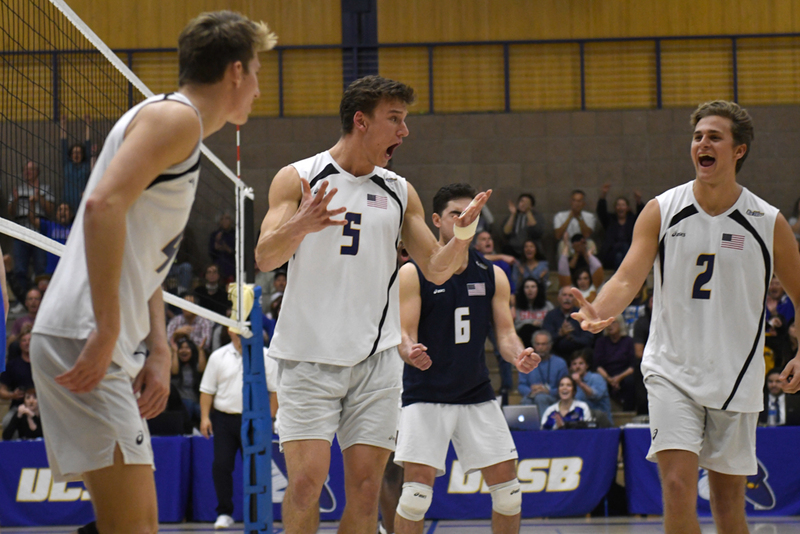 Pictured above, Gaucho volleyballers Ryan Wilcox (4), Keenan Sanders (5), Hayden Boehle (6) and Casey McGarry (2) are fired up during their five-set victory over UCLA. A rivalry that boiled over 45 years ago continues to fire up the crowds in UCSB’s Robertson Gym. 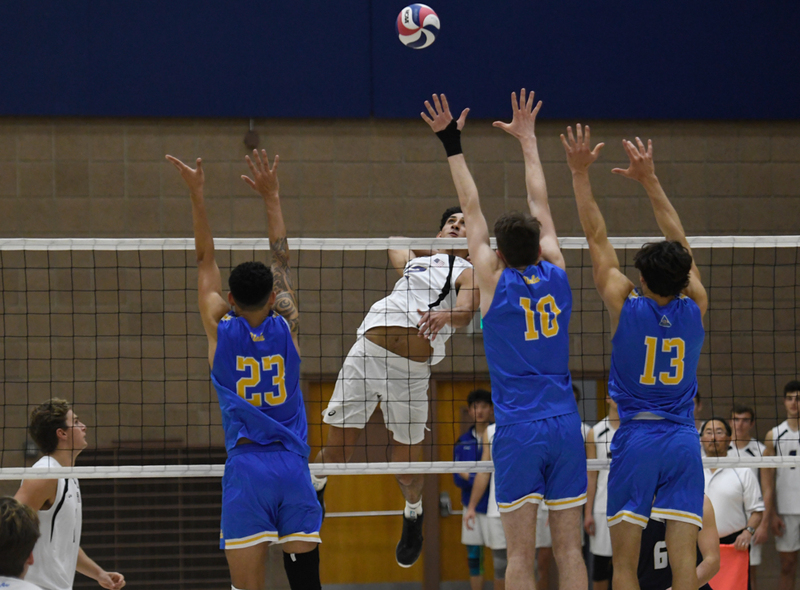 In the first six years that the NCAA sponsored men’s volleyball championships, the Gauchos met UCLA in the final three times, and each time, the Bruins prevailed. The 1974 final was played at Rob Gym and was an epic match in which the Bruins rallied to upset the top-seeded Gauchos. That result seemed to solidify a UCLA dynasty that has brought 19 national championships to Westwood. The Gauchos, meanwhile, still seek their first NCAA volleyball crown. They have been runners-up twice more, losing in five sets to USC in 1988 and Ohio State in 2011, McLaughlin’s third year at the helm. During their streak, the Gauchos defeated five nationally ranked teams — including back-to-back sweeps of then-No. 3 BYU — as well as sweeps of Ohio State and Penn State. Throughout that surge, outside hitter Corey Chavers was an inexorable force for the Gauchos, posting double-digit numbers in kills each time out. After he pounded 20 kills in a four-set victory over No. 5 Loyola-Chicago on January 26, Chavers was named the American Volleyball Coaches Association (AVCA) national player of the week, the first time a Gaucho was accorded that honor since Jeff Menzel in 2011. Chavers, a 6′4″ senior, blasted a match-high 20 kills with a .472 hitting percentage against UCLA. 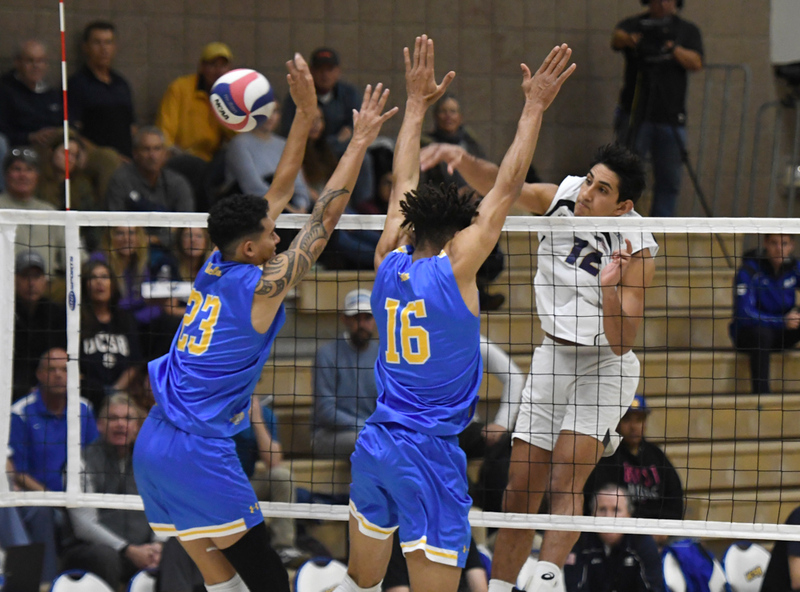 He punctuated the opening set with a pair of ace serves as the Gauchos showed they were not the same team that had lost their previous match at Pauley Pavilion. Each time UCLA came back, they had a response. The set scores were 25-18, 21-25, 25-20, 19-25, and 15-12. The Gauchos trailed early in the fifth set but came back on their own steady play and UCLA errors. Chavers scored match point by blocking Austin Matautia. “It felt good ending the match like that,” he said. If he had not lost a bet in high school, Chavers might never have discovered his talent for volleyball. He was a sophomore basketball player at Gahr High in Cerritos. “A friend on the volleyball team always talked to me about trying out,” he said. “We made a bet on a football game, the Cowboys and Patriots or something. All I remember is, I lost the bet, and I had to try out for volleyball.” He helped Gahr’s Gladiators win their first league volleyball championship in a dozen years and make it to a CIF championship match in 2014. Pictured right and below, senior hitter Corey Chavers (12) pounded 20 kills through the Bruins’ block and earned his third Big West Player of the Week accolade of the season. Chavers is the only senior starter for the Gauchos other than Hayden Boehle, who makes appearances as a libero for defensive purposes. A pair of freshmen came up big against UCLA, Ryan Wilcox making 10 kills and Brandon Hicks producing five blocks. A trio of juniors — Keenan Sanders (eight kills), Spencer Fredrick (nine digs and five blocks), and setter Casey McGarry — filled out the lineup. McGarry filled in for injured setter Randy DeWeese and delivered 33 assists. The UCLA match improved the Gauchos’ record to 12-3 before beginning their slate of Big West matches. In its second year of volleyball, the conference has emerged as the nation’s toughest. The 1-2-3 teams in last week’s NCAA rankings were Big West teams Long Beach State, the defending national champion, Hawai‘i, and UC Irvine. Long Beach State will visit UCSB on March 15. The conference tournament on April 18-20 at Hawai‘i will decide an automatic NCAA bid. McLaughlin said the Gauchos have played the nation’s toughest schedule to date, and as long as they continue playing at that level the rest of the way, they should have an argument for an at-large NCAA bid regardless of the tournament’s outcome. They would like nothing better than the opportunity to play UCLA in the postseason again.